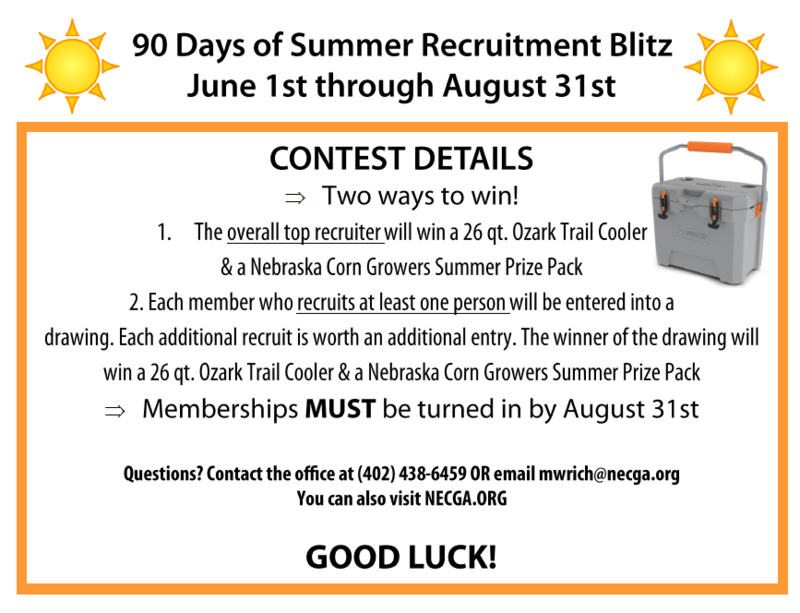 The Nebraska Corn Growers Association is excited to announce the 90 Days of Summer Recruitment Blitz. From June 1st through August 31st, members are encouraged to recruit their family, friends, and neighbors to join or re-join the association. Points will be calculated using NCGA’s recruiter point system. As a reminder, 3-year memberships are $190 with the $150 seed incentive, 1-year memberships are $80 without the $150 seed incentive, and students memberships are $20 for 1 year. Good luck! Feel free to print off as many of the below membership forms that you need! I am Brooke Tempel, your new Nebraska Corn Growers Association intern for the next 2017-2018 year. I am going to be a senior at the University of Nebraska-Lincoln this coming fall. Where I am majoring in agricultural education with minors in agribusiness and horticulture. I grew up on an acreage west of Seward, NE. Growing up I was involved in 4-H and FFA. These programs sparked my interest in agricultural and persuaded me to pursue a career in agriculture. Although I never had the opportunity to grow up on a farm myself and personally experience the farm firsthand, I understand the impact that our local farmers and ranchers make in our community and world. I am excited to be able to advocate for our local producers and share their story through this internship. I look forward to learning about everything “corn” and to share it with others at our American Ethanol Nights at the races, baseball games, and other local events. I hope to meet some of you at local events this coming year! 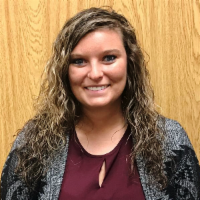 When I first walked into the Nebraska Corn Growers Association office in May of 2016, I entered with high hopes and anticipation to get started. Today, exiting my internship, I leave with a full heart and excitement to use the skills I have gained to better the agricultural industry. Although my feet are heavy to leave NeCGA as an intern, I am excited to find my part of the agricultural industry. Throughout my internship, I have been able to gain knowledge in agriculture from a political and educational perspective. Although many of the projects I have helped be a part of will stay here at the office, this mindset will never leave me. I hope to give back to Nebraska’s corn industry by extending these findings to others, consumers and producers alike. This fall, I have an opportunity to educate high school students in agriculture at the Waverly High School agricultural education program through my student teaching experience. I am excited to take on this experience and live out my Agricultural Education Undergraduate Major in full swing. Although I am not exactly sure where my next fit in an agricultural related career will take me after my graduation in December of this year, I know that I will stay rooted in the industry and hope to become active in my soon to be local corn grower association, Hamilton County. As I will be marrying a farmer from Aurora, NE following graduation, we hope to tell the story of agriculture through our experiences as well as give back to NeCGA and the NE farmer. Thanks to NeCGA and NCGA’s hard work on influencing policy that benefits agriculture here in Nebraska and globally, we can do our best to be active in that process, helping out our state, neighbors, families, and ourselves. Not only will the agricultural knowledge and advocacy skills come with me when I leave the office, but also my thankfulness for the NeCGA, NE farmer, and the staff I worked with. NeCGA continually goes above and beyond for the future of Nebraska’s farmers and agricultural industry; I was able to witness that first hand. The passion of the staff, board members, and members across the state was evident and contagious. The beautiful thing about it was that this passion was not fueled as benefit for self, but benefit for an industry that we all take part of. At work, I was continually reminded of why I was there. Thanks to the farmers across the state, we can eat, drive our cars, sit in our offices, and the list goes on and on and on… Without the agricultural industry, we simply could not do the things we do. Thanks to the farmers for their hard work day and night, it is possible for us to live the life we do as well as care for the Earth correctly. Finally, the staff I worked with every day have not only been impactful, but genuinely inspiring to my life as an intern and young professional. Each staff member took the time to invest in me to help me become my best I could possibly be at whatever I was doing. They have lead by example what it means to work hard for someone else, professionalism, and valuing a staff team. I hope to someday resemble them and their efforts in the work force. Over all, I have enjoyed my internship immensely and could not be more grateful for the experience I have had. Although I am sad to say goodbye, I know that this is only a farewell as an intern. I am still going to stay involved and do my part in the agricultural industry, however/wherever that looks. Also, I am proud to announce that you will have a wonderful new intern joining NeCGA for this next year! 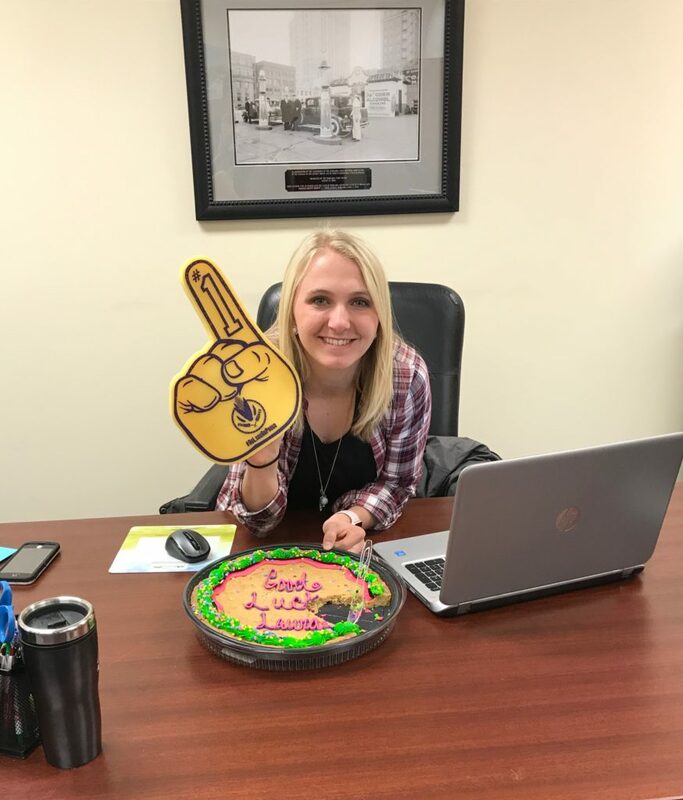 Brooke Tempel, a fellow co-worker of mine at the Nebraska State 4-H office, is excited to become a part of NeCGA as the new 2018-2019 intern.